Plants perennial; cespitose, not rhizomatous. 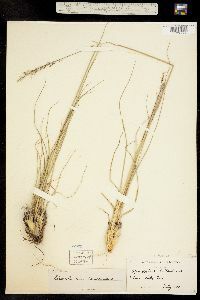 Culms 30-80(90) cm. 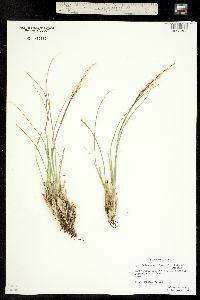 Sheaths dull and fibrous basally, glabrous or sparsely pilose below, hairs to 4 mm, contorted; ligules 0.1-0.3 mm; blades 7-31 cm long, 1.2-2.5 mm wide, flat to folded, glabrous abaxially, scabridulous adaxially, margins scabrous. Panicles 5-22(25) cm long, (0.6)1-11 cm wide, open to somewhat contracted, longer than wide, narrowly pyramidal, not diffuse; lower nodes with 1-2(3) branches; primary branches 0.6-8(11) cm, appressed or spreading to 70° from the rachis, not capillary, without spikelets on the lower 1/3; pedicels 0.8-6 mm, appressed, occasionally spreading. 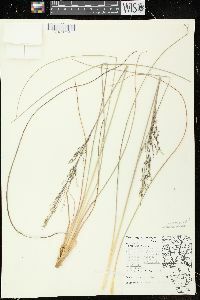 Spikelets 3-6 mm, plumbeous. 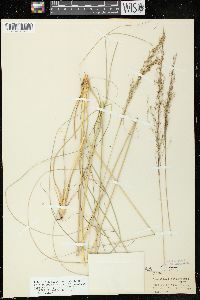 Glumes unequal, lanceolate, membranous; lower glumes (1.2)1.8-4.5 mm; upper glumes 2.4-6 mm, at least 2/3 as long as the florets, occasionally 3-veined; lemmas (2.7)3-4.3 mm, ovate, membranous, glabrous, acute; paleas 3.1-4.5 mm, slightly longer than the lemmas, ovate, membranous, glabrous; anthers 1.7-3 mm, yellowish to purplish. 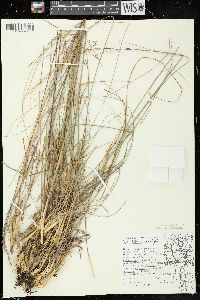 Fruits 1.4-2.1 mm, pyriform to globose, indurate, without a loose pericarp, smooth, shining, light brown. 2n = 72. 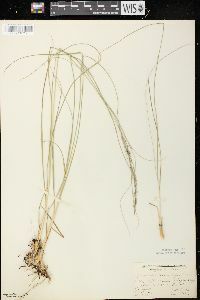 Sporobolus heterolepis grows at elevations of 40-2250 m, in lowland and upland prairies, along the borders of woods, roadsides, and swamps, and in north-facing swales. 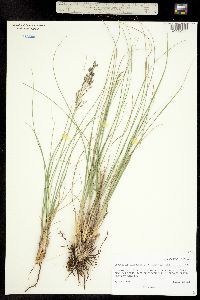 It is associated with many plant communities, and is also available commercially as an ornamental. 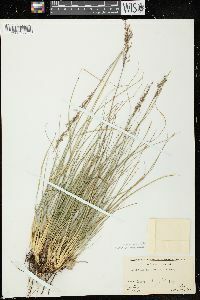 It is restricted to the Flora region. Perennial tufted herb 30 cm - 0.34 m tall Leaves: having open, contorted sheaths that are dull and fibrous near the base and hairless to sparsely soft-haired (to 4 mm long) beneath. 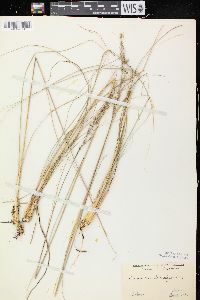 The ligules are made of hairs 0.1- 0.3 mm long, and the blades are 7 - 31 cm long, 1.2 - 2.5 mm wide, flat to folded, rough along the margins, hairless beneath, and minutely rough above. 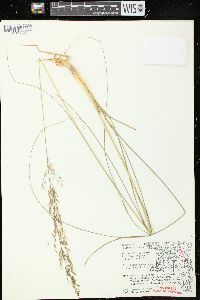 Inflorescence: terminal, branched (panicle), 5 - 25 cm long, 0.6 - 11 cm wide, narrow pyramidal, usually open, fragrant. 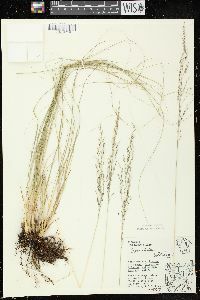 The primary branches are 0.6 - 11 cm long, appressed or up to 70 degrees from the main axis, and lack spikelets on the lower third of the branch. 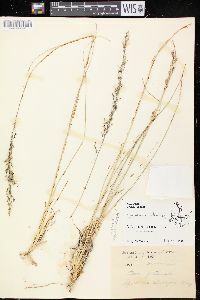 Fruit: a shiny light brown caryopsis, 1.4 - 2.1 mm long, pear-shaped to spherical, hardened, smooth, and lacking a loose pericarp (wall of mature ovary). 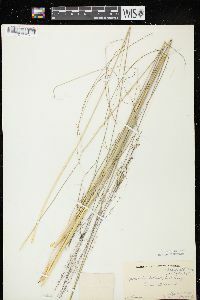 Culm: 30 cm - 0.9 m long, hairless. 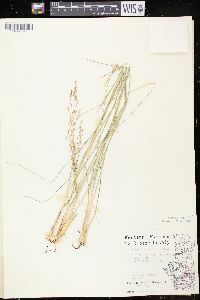 Spikelets: lead-colored, 3 - 6 mm long, borne on appressed or sometimes spreading stalks 0.8 - 6 mm long. 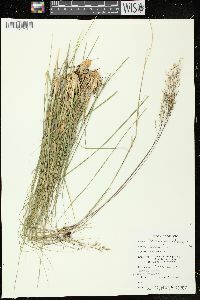 Glumes: unequal, lance-shaped, and membranous. 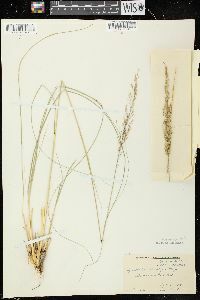 The lower glume is 1.2 - 4.5 mm long, and the upper glume is 2.4 - 6 mm long. 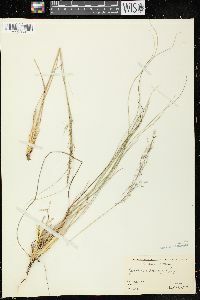 Florets: usually one per spikelet, with yellowish to purplish anthers 1.7 - 3 mm long. Lemma: 2.7 - 4.3 mm long, egg-shaped with a pointed tip, membranous, hairless. Palea: 3.1 - 4.5 mm long, egg-shaped, membranous, hairless, two-veined, often splitting between the veins when mature. 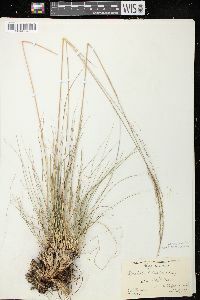 Similar species: Sporobolus neglectus and Sporobolus vaginiflorus are annuals that are easily distinguished by their inflated sheaths. 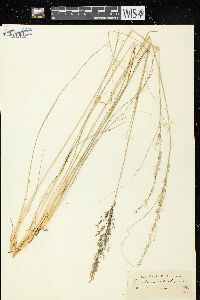 The spikelets of Sporobolus cryptandrus are less than 3 mm long. 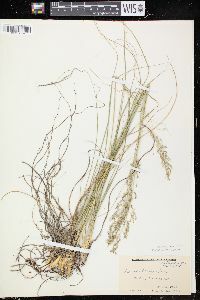 Sporobolus clandestinus and Sporobolus compositus var. 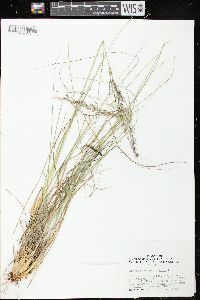 compositus have narrow, spike-like, non-fragrant inflorescences with the bases surrounded by the uppermost leaf sheaths. 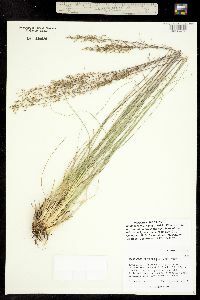 Habitat and ecology: Characteristic of mesic and hill prairies. 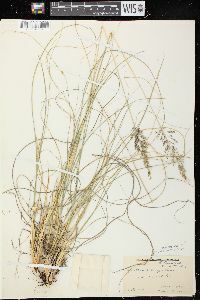 Etymology: Sporobolus comes from the Greek words sporos, meaning seed, and ballein, meaning "to cast forth." 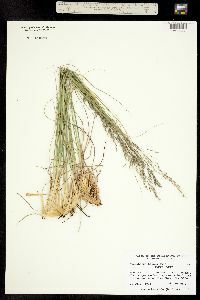 Heterolepis means "with unequal glumes." 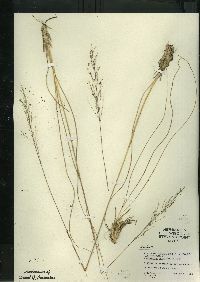 This species is infrequent to very local in a few of our northern counties. 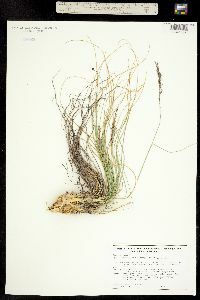 It is found in dry or moist prairie habitats. 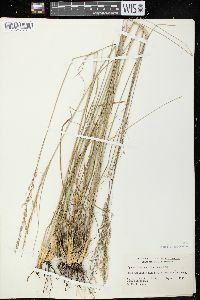 Erect, tightly clustered perennial 4-10 dm; lvs very long, narrow, usually involute, crowded toward the base; panicle 1-2 dm נ1.5-3 cm, cylindric to narrowly ovoid, with whorled, ascending, mostly racemiform and basally naked branches, these and the pedicels irregularly interrupted by paler, slightly dilated segments; spikelets 3-6 mm; first glume half as long as the second, subulate above a broader base; second glume acuminate into a carinate or involute tip, usually slightly exceeding the lemma; palea usually slightly exceeding the lemma; fr globose, 1+ mm thick; 2n=72. 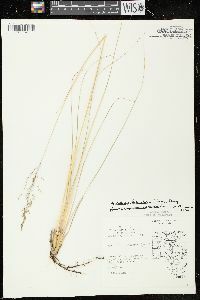 Dry open ground, especially on prairies, often in slight depressions; O. to Sask. and Tex., e. occasionally to Pa., Conn., and Que.